The 81-year-old was diagnosed last year. McCain was first elected as a senator in 1987. US SENATOR JOHN McCain’s family say he has chosen to discontinue medical treatment for brain cancer. McCain’s brain tumour was diagnosed last year after he had undergone surgery to remove a tumour and blood clot from above his right eye. His tumour is known as a glioblastoma – a highly aggressive cancer that begins in the brain. In a statement today tweeted by his daughter Meghan, the family said that the 81-year-old had “surpassed expectations for his survival” in the past year but that the disease has continued to progress. “Last summer, Senator John McCain shared with Americans the news our family already knew: He had been diagnosed with an aggressive glioblastoma, and the prognosis was serious. In the year since, John has surpassed expectations for his survival. But the progress of disease and the inexorable advance of age render their verdict,” the family said in a statement. McCain is a war veteran who was a former prisoner of war in Vietnam and went on to challenge for the White House. The Republican ran for the US presidency against Democrat opponent Barack Obama in the 2008 US election, with controversial governor of Alaska Sarah Palin as his running mate. In the event, he won 173 electoral college votes versus Obama’s 365. Email “Veteran US senator John McCain chooses to stop brain cancer treatment”. 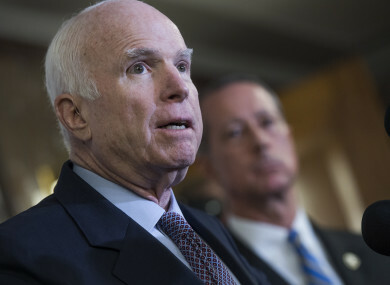 Feedback on “Veteran US senator John McCain chooses to stop brain cancer treatment”.